The information on this page is from many sources. I have done a lot of research myself, in New Zealand, Nova Scotia and Scotland, and in the Australian newspapers on Trove. I have also have communicated with members of the extended family in various parts of the world. I am especially greatful for the assistance provided by the late Betty Powell in the Waipu Museum in New Zealand. More recently, DNA research is solving some mysteries and creating others. Please contact me if you have additions, corrections or questions, and particularly if you are related to our branches of the McLeod, McDonald, McGregor or McKenzie families. As far back as I can trace (to the 1700s), all four branches of my grandmother's Scottish ancestors came from the north-west coast of the Scottish Highlands. 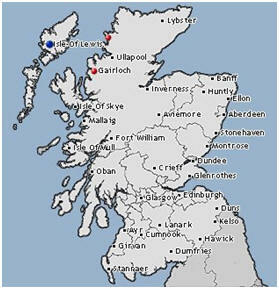 Generations of our McLeod ancestors were tenant farmers on Clachtoll, Assynt in Sutherlandshire - on the north-west coast of Scotland (northern red dot on map on the right). Mary McLeod: born c.1803 Clachtoll; married John Fraser in Nova Scotia and they had 6 children; died 1871 in Waipu, Northland, NZ. Barbra McLeod: born 1806 Clachtoll. Murdoch McLeod: born 1809 Clachtoll; married Isabella MacDonald in Cape Breton, Nova Scotia and they had 7 children; died 1863 in Auckland, NZ. Dolina McLeod: born c.1813 Clachtoll; married Roderick Fraser in Nova Scotia; died 1889 in Whangarei, Northland, NZ. Luther McLeod: born c. 1817 Clachtoll; married (1) Joanna McLeod and they had 4 children; married (2) Mary and they had 5 children; married (3) Flora McKay; he died 1855 in Nova Scotia. Annie McLeod: born c.1819 Nova Scotia; married Angus 'Timber' McLeod in Nova Scotia and they had 8 children; died 1900 in Ingonish, Cape Breton, Nova Scotia. Isaac McLeod: born 1821 in St Ann's, Cape Breton, Nova Scotia; married Euphemia Todd Laurence in 1835 in Nova Scotia and they had 6 children; died 1888 in Strathlorne, Nova Scotia. Pauline McLeod: born 1824 in St Ann's, Cape Breton, Nova Scotia; married widower Roderick McFadyen; died in 1910 in North Ingonish, Cape Breton. Donald 'Squire' McLeod and his wife Jessie did not migrate to New Zealand. It may have been because Jessie was unwell (she died soon after), or it may have been because he had had a falling out with the Reverend Norman McLeod. Four of their older children, and their families, migrated to New Zealand and the youngest four stayed in Nova Scotia with their families. Jessie McLeod nee Munro died on 21 October 1852 at South Gut, Cape Breton, Nova Scotia. 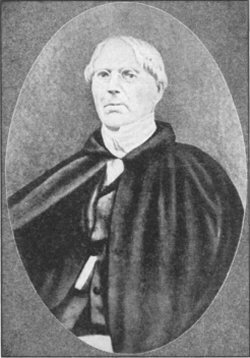 Her husband Donald 'Squire' McLeod died at age 97 on 16 May 1879 at South Gut, Cape Breton, Nova Scotia. My great-great grandfather, John Donald ‘Arichat’ McLeod, led a long (83 years) and interesting life. His first 15 years were with his family on Clachtoll Farm, on the coast in Assynt, Scotland. He would have attended the local parish school, as education was valued by the Highlanders. He would also have learnt to sail and handle boats. In July 1818, at the age of 15, John left Scotland forever and sailed with his parents and 6 siblings to Pictou, Nova Scotia on the Perseverance. 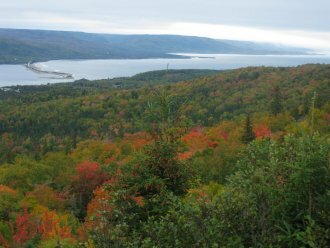 In the following years, John would have been busy helping his family build a house and establish a farm on Middle River, up-river from Pictou, only to pack up and move to St Ann’s on Cape Breton Island in 1820, where they started clearing the wilderness all over again. We do know that John would at least have had one day of rest each week, as these Scots were very observant – on the night before the Sabbath they even overturned the troughs which collected the maple sap, so as not to 'work' by collecting the Sunday dripping. In 1824, John Donald McLeod married Anna McGregor in Sydney, Cape Breton. She was the fifth child of Donald McGregor and Mary McRae who had both been born in about 1770 in Gairloch, Rosshire, Scotland. In 1825, John Donald McLeod set up a business in partnership with a J. Nood in Sydney, Cape Breton Island. They had a store and trading activities – timber, fish and fish oil were the primary articles of trade. The McLeod's had their own jetty in the South Gut of St Ann's Bay and John traded regularly with the French settlement of Arichat on Isle Madame in the south of Cape Breton Island; hence his nickname (the placename Arichat is derived from the Micmac Indian Nerichat "the camping ground"). Much later in New Zealand, John Donald McLeod also had store in Auckland, the first store in Waipu, and the first store in Whangarei Heads. 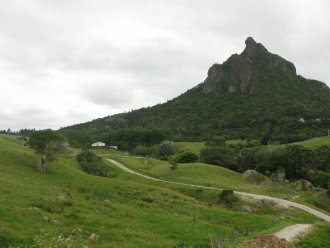 He also purchased a beautiful peninsula of land at Whangarei Heads to be farmed by himself and his sons. Ann McLeod: born 1827 in St Ann’s Glen, Cape Breton; married Donald Stuart of Nova Scotia and they had 7 children; she died 1897 in Whangarei Heads, NZ. Murdoch McLeod: born 1829 in Cape Breton, Nova Scotia; he died 1847 in Nova Scotia, age 18. Mary McLeod: born1831 in St Ann’s Glen, Cape Breton; married her cousin Murdoch McLean of St Ann's and they had 8 children; she died 1887 in Waipu NZ. Jessie McLeod: born 1832 in St Ann’s Glen, Cape Breton; married George Ross of Scotland and they had 7 children; she died on 1884 in Auckland NZ. John McLeod: born and died 1834 in St Ann's, Cape Breton, Nova Scotia. Donald McLeod: born and died c1836 in St Ann's, Cape Breton, Nova Scotia. Margaret (Maggie) McLeod: born c1838 in St Ann’s Glen, Cape Breton; married her cousin Donald McLean of Nova Scotia and they had 2 children; she died on 1864 in Northland, New Zealand, age 26. Alexander McLeod: born 1840 in St Ann's, Cape Breton; he died 1846 in St Ann's, Cape Breton. John Alexander McLeod: born c1841 in St Ann's, Cape Breton; married Frances Wykes and had 4 children; died 1919 at Whangarei Heads, New Zealand. Alexandrina 'Lexy' McLeod: born c1843 in St Ann’s Glen, Cape Breton; married Alexander Ronald Ross of Nova Scotia and they had 10 children; she died in 1930 in New Zealand. Donald John McLeod: born 19 July 1845 in St Ann’s Glen, Cape Breton; married on 25 Dec 1866 in Whangarei NZ to Margaret McDonald, born c1848 in Boularderie, Cape Breton; they had 5 children. Both Donald and Margaret died young; he died on 11 Aug 1892 in Ballarat Vic and she died a few years later on 26 Feb 1896 in South Yarra Vic; they are both buried in the McLeod family grave in St Kilda cemetery. Joanna McLeod: born 1846 in St Ann's, Cape Breton; she died 1852 in St Ann's, Cape Breton. My great-great grandfather John Donald McLeod died on 27 Jul 1886, seven years after his wife Anna McLeod née McGregor had died on 29 March 1879. Both are buried in the lovely old Pioneer Cemetery in Whangarei Heads, Northland, New Zealand. How they got to New Zealand is another story . . .
My great-great grandfather Donald McDonald was born on 6 May 1808 in Gavaich, Gairloch, Scotland. 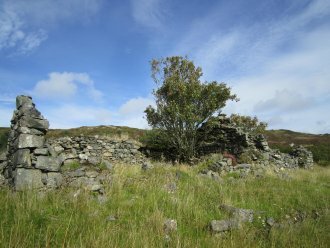 He had at least two siblings and his father Murdoch McDonald was a tenant farmer at Garvaich. It is not known when Murdoch and his family went to Nova Scotia, but we do know that Donald McDonald married Margaret McKenzie in 1834 in Nova Scotia. Donald's occupation was stated as farmer, but he was also a Justice of the Peace. He appears to have been a community leader and was one of the first settlers to take up land (210 acres) in the Waipu area in New Zealand. Murdoch McDonald: born 1835 in Boularderie, Nova Scotia; married Margaret Cameron of Lochalsh, Scotland; they had 4 children; he died 1898 in Auckland NZ. Norman McDonald: born 1837 in Boularderie, Nova Scotia; married Margaret Morrison of Nova Scotia; they had 9 children; he died 1895 in Auckland NZ. Kenneth McDonald: born on 15 May 1838 in Boularderie, Nova Scotia; married Mary Ann McAulay of Waipu NZ; they had 12 children; he died 1920 in Auckland NZ. Mary McDonald; born on 16 Mar 1842 in Boularderie, Nova Scotia; married James Hoe of Dover England and they had 4 children; she died 1918 in Auckland NZ. William McDonald; born on 16 Mar 1844 in Boularderie, Nova Scotia; married Isabella Fraser of Nova Scotia; they had 8 children; he died 1930 in Auckland NZ. Margaret McDonald: born 1847 in Boularderie, Nova Scotia; married Donald John McLeod of Nova Scotia in Whangarei NZ on 25 Dec 1866; they had 5 children; she died on 26 Feb 1896 in South Yarra, Victoria, Australia. John James McDonald: born about 1848 in Boularderie, Nova Scotia; he died 1918 in Auckland NZ. Roderick McDonald: born about 1848 in Boularderie, Nova Scotia; he died 1874 in Auckland NZ. Alexander McDonald: born 1850 in Boularderie, Nova Scotia. Christina McDonald: born 1852 in Boularderie, Nova Scotia; died as an infant. Colin McDonald: born 1855 in Waipu NZ. Donald McDonald: born 1856 in Waipu NZ; married Ann McLean of Waipu NZ; they had 4 children; he died 1835 in Auckland NZ. Christina Annabella McDonald: born 1858 in Waipu NZ; she died 1904 in New Zealand. My great-great-grandfather Donald McDonald died on 28 Dec 1874 at Waipu NZ. His wife Margaret McDonald née McKenzie died on 12 Jun 1885, also at Waipu NZ. They are buried in the Waipu Cemetery with many other Scottish Nova Scotians from their community. Six months in a leaky boat . . . 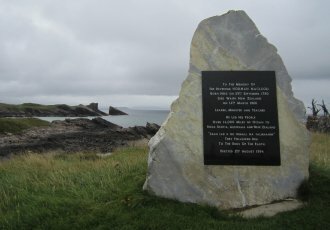 In 1848 there was a famine in St. Ann’s, Nova Scotia. Early and late frosts ruined the crops, there was potato blight, the fishing was not successful and trade in lumber was in a state of stagnation. Rev Norman McLeod had to apply to the government for assistance. In the middle of the famine, a letter arrived from Australia, from his long-lost second son Donald McLeod. It extolled the virtues of the climate and of the city of Adelaide, which was free of the convict stain. Rev McLeod was convinced that this letter was a sign of 'Divine Providence'. 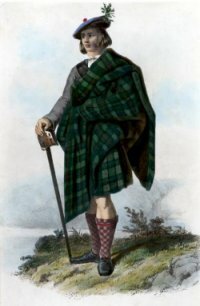 After much thought and further correspondence, he decided his followers should relocate to Australia – mainly for the sake of the young people but also because the new colony needed them: “no people would answer better in South Australia than our Scotch people reared in this country”. Preparations were made for the trip -- the settlers had to sell their land and wind up or liquidate their extensive business affairs. Two ships were built by the McGregor brothers, the Margaret and the Highland Lassie, with everyone on the community helping in whatever way they could. My great-grandfather, John Donald ‘Arichat’ McLeod, his wife Anna and their 8 children sailed on the Margaret. His parents, Donald 'Squire' and Jannet (Jessie)McLeod were amongst those who decided not to leave Nova Scotia; in part this may have been health-related, as Jessie died only a few months after they sailed. Donald 'Squire' McLeod had also had a falling out with his brother-in-law Rev Norman McLeod; they were not on speaking terms and Donald may have decided it was prudent to stay where he was. However, it must have been a wrench to farewell several of his children and their families when they left for the other side of the world, knowing they would never meet again. The Margaret was the first of six ships that eventually made voyage south. She sailed on 28 October 1851 under Captain Watson, with Rev Norman McLeod, his family and 140 of his followers on board. Each family supplied itself with provisions for the voyage, but the group also travelled as a self-contained community, supplying from within their own ranks the necessary masters, officers, crew and even schoolmasters for the 40+ children on board. Rev McLeod was himself an expert navigator and used a quadrant to take daily observations of the sun in order to work out the daily latitude and longitude, to check the calculations of the officers. After calling at the Cape Verde Islands and at Capetown, the Margaret reached Port Adelaide on 11 April 1852. There, Rev McLeod found a letter from his son Donald, saying that he had gone on to Melbourne. They investigated the possibility of securing sufficient good land that was not too far inland, but were disappointed. A few decided to remain, but most left with the Margaret on 27 May, arriving in Melbourne on 4 June 1852. The ship was sold as had been pre-arranged before they left Nova Scotia. Melbourne was another disappointment as the gold rushes had increased the demand for and price of land. The new settlers easily found work as there was a huge demand for both trade skills and merchants, but they were forced to live in the midst of violence, crime and disease in the vast canvas town that had grown up along St Kilda Road. Typhoid fever broke out and many died; Rev McLeod lost 3 of his sons within 6 weeks. Many of the younger men went to the goldfields and some were quite successful -- it is said that several Waipu NZ farms were bought with money earned on the Australian goldfields. Meanwhile, the second ship being built in Nova Scotia, the Highland Lass, had been completed. She was a 179 ton brig and had expected to set sail in December 1851, two months after the Margaret, but she was caught in ice that closed the harbour until the spring. The passengers were already on board and had to go ashore for the winter, staying with friends or returning to their old homes if they still had them. She finally sailed on 17 May 1852 with 136 passengers and crew, had a three-week stop in Simon’s Town, Cape of Good Hope, and arrived in Adelaide on 6 Oct 1852. The Margaret group had already moved on to Melbourne. On the Highland Lass were the other half of my Scottish ancestors. Donald McDonald and Margaret McDonald née McKenzie sailed with their 10 oldest children, including my great-grandmother Margaret McDonald, age 4. The youngest 3 of their children were born in New Zealand. 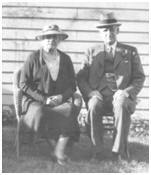 Margaret McDonald nee McKenzie’s elderly parents Murdoch and Arabella McKenzie were also on board the Highland Lass. Murdoch McKenzie died in Adelaide on 10 Mar 1853, a few months after they arrived. He was age 76 and the cause of death was given as “decay of nature”. He had been born in 1777 in Gairloch, Scotland and he and his brother had been weavers, although he appears to have taken up farming in Nova Scotia, perhaps out of necessity. In about 1812 he had married Arabella McKenzie and they had 7 children, all of whom came to New Zealand with their families; this was probably the reason why the elderly parents also made the trip. Arabella McKenzie died on 12 Nov 1883 in Waipu NZ, at the age of 95. Still seeking a suitable place to settle the whole community, Rev Norman McLeod wrote early in 1853 to Governor George Grey of New Zealand, asking for suitable land for his people. Governor Grey encouraged them to come to New Zealand. After 12-18 months in Melbourne, Duncan and Murdoch McKenzie purchased the 175 ton Aberdeen schooner Gazelle and left for Auckland with 90 from the Highland Lass and 33 from the Margaret. They arrived in Auckland on 18 September 1853. The rest of the Margaret passengers who had gone on to Melbourne and dispersed then started arriving in Auckland singly or in small groups. They were many months in Auckland while the land issues were being sorted out, further complicated by Governor Grey being recalled to England soon after they arrived. In the end, they chose Waipu in the north of New Zealand as the most suitable area for the new settlement. They chose Waipu over other suggestions, including in the South Island, as it was suitable for fishing, ship building, and farming. There was also sufficient land for the Gaelic-speaking community to remain together to worship with their minister, the Rev Norman McLeod. By the end of 1859, four more shiploads of settlers had arrived from Nova Scotia. It is estimated that by 1860 there were 883 Scottish Nova Scotian settlers there, representing 19 Scottish clans. They set about the task of establishing a close-knit and highly successful community in Waipu and sister settlements. Rev. Norman McLeod lived quietly in Waipu until his death on 14 March 1866, at the age of 85. His flock continued in their Normanite ways and there was a service in Gaelic and another in English each Sunday, for as long as they could find a bilingual minister. As the years passed many of them married outside the community and moved away, although most of their descendants remain in New Zealand. I am in contact with some of our Scottish cousins in New Zealand but, given the size of the original settlers' families, there must be thousands more descendants to whom we are related. My grandmother's parents Donald John McLeod and Margaret McDonald were quite young at the time of this adventure and probably had little or no memories of it. Although both their death certificates record their place of birth as Nova Scotia, Donald McLeod’s grave in St Kilda cemetery erroneously records that he was "of Auckland". The Waipu Museumin New Zealand tells the story of the Great Migration, when almost 1000 people completed a remarkable migration from Scotland to Nova Scotia to New Zealand, to establish a close knit and highly successful Gaelic speaking community in Waipu, Northland.in New Zealand tells the story of the Great Migration, when almost 1000 people completed a remarkable migration from Scotland to Nova Scotia to New Zealand, to establish a close knit and highly successful Gaelic speaking community in Waipu, Northland. My great-grandparents Donald John McLeod and Margaret Anne McDonald were married in Whangarei, New Zealand, on 25 Dec 1866. They were bachelor and spinster. They were both recorded as being of full age; but later records indicate that they were 20 and 18 when they married (her year of birth is hard to establish because her age varies on various documents). Donald’s occupation at this time is given as storekeeper. Later he would be listed on documents as insurance agent, inspector for life insurance company, and company manager. Donald John McLeod and Margaret née McDonald had five children. The first four were born in Waipu NZ, but the family had moved to Australia just before their last child was born. Donald Alexander McLeod: born Feb 1869 in Waipu NZ; Donald died from a ravaging form of TB on 4 Mar 1890 in Melbourne, Victoria, Australia. He was the first of three of the McLeod siblings to die of TB at an early age. Luther John 'Lu' McLeod: born 1872 in Waipu, NZ. He was an accountant in Sydney and was involved in an import business with his brother-in-law, my grandfather Richard Andrew Escott. Lu died of Phthisis Pulmonalis (TB) on 5 Jun 1901 in Sydney, NSW, Australia. In 1926, her daughter Vivian Johnson married Tom Dalzell Bolton, the brother of her school friend Helen Bolton who had married my uncle Doulas McLeod Escott. Vivian and Tom Bolton had no children, and Vivian died in 1939, at age 40; she had severe arthritis. Meanwhile, Douglas McLeod Escott had died in 1933, aged 32, leaving a young son Douglas. Clarence 'Clarrie' Stuart McLeod: born on 6 Aug 1878 in Grafton NSW (and named after the Clarence River). He enlisted to serve in WW1 in 1916 at the age of 39; he served in France; after the war he married Evelyn Mary Vicars-Foote in 1923; they had one son Stuart Richard John McLeod; Clarrie died 19 Sep 1962 in Heidelberg, Victoria, Australia. Donald John McLeod died in Ballarat Vic, on 11 August 1892, age 45, of pleurisy pneumonia. His wife Margaret McLeod née McDonald died a few years later in South Yarra, Melbourne on 26 Feb 1896, age 47, of carcinoma of the liver. Donald, Margaret and their children Donald Alexander and Rhoda Jessie are buried in the McLeod-Escott family grave in St Kilda cemetery. My grandmother Maggie died before I was born, but my mother remembered her fondly as a short, stout and rather Scottish woman who came into town to inspect my mother as soon as she heard that her son had a female friend. Apparently she approved, even though my mother was a Catholic! 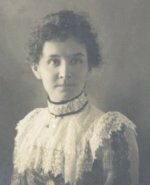 Margaret Anne McLeod was born on 21 Oct 1867 in Waipu, Northland, New Zealand. Nothing is known about her childhood other than that she was the oldest of 5 children and grew up in a Gaelic-English bilingual community in New Zealand. She married Richard Andrew Escott on 23 Oct 1893 in Christchurch NZ. They were both 25. She probably met him through her parents, as her father Donald McLeod was District Agent for the AMP Assurance Society and my grandfather at that time was travelling the country districts as a representative of AMP. Later, my grandfather went into business with her brother Lu McLeod, who was an accountant. Their first child, Bruce, was born in New Zealand on 8 Aug 1894. It is not known whether they were both still living in New Zealand at that time, or if RA Escott was travelling with his job or on one of his many trips back to England. His father James Escott provided the details to the Births Registrar. The next child, Leslie, was born in Australia on 28 Jun 1896. Maggie then accompanied her husband, with the two children (and a nurse) on one of his business trips to England. In 1890, she lost her 21-year-old brother Donald to TB. In 1892 her father died suddenly at the age of 45 and in 1896 her mother died of cancer, aged 47. In 1901, her beloved 26-year-old sister Rhoda died of TB, after a long illness and then her 29-year-old brother Luther died 3 weeks later, also of TB. Especially for someone who had grown up in such a tight-knit family-oriented community, Maggie must have been devastated to have lost almost all her family, and to lose a brother and a sister in such a short period. Her only surviving sibling was now her youngest brother Clarrie. 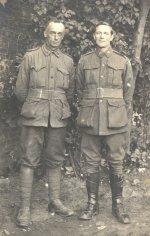 (He served in France in WW1, the man on the left in photo). Both Maggie and her brother Clarrie each went on to have a long, healthy life and escaped the family scourge of TB and the premature deaths of both their parents. Maggie and Richard Escott had seven sons, although they lost their eldest son Bruce at the age of 22, probably to a form of TB. Maggie’s children, life and travels are covered in more detail in the Escott section on her husband. She was extremely proud of her seven sons, whom she raised to be fine men. She loved her many grandchildren and no doubt took delight in the many girls born in the next generation, a compensation for the daughters she didn’t have herself. Margaret Anne Escott née McLeod died in Melbourne on 5 July 1940 from carcinoma of the breast, arteriosclerosis and myocarditis. She is buried in the McLeod-Escott family grave in St Kilda Cemetery. For information about Maggies husband, Richard Andrew Escott, see the Escott page of this website. 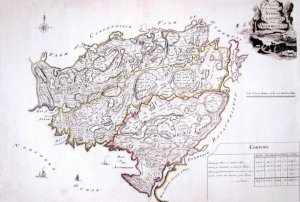 A 1774 map of Clachtoll (yellow borders). Except near the coast, very little has changed in nearly 240 years. Why did my grandmother's ancestors leave the Scottish Highlands? 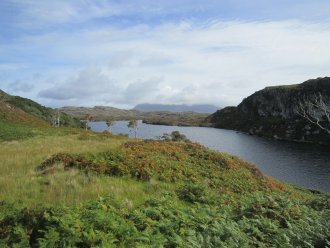 In the 1700s in the parish of Assynt, 300 families lived on a mere 300 acres of arable land. The staple foodstuff was meal and, after 1750, potatoes. 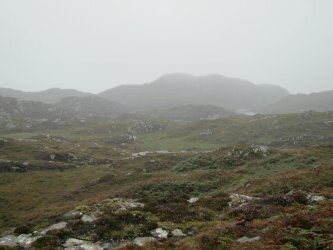 Oats and barley were grown during the short growing season of the Highlands, but most meal had to be imported because local supplies were not sufficient. Black highland cattle were raised as the only saleable product. They were not eaten by the people, as they were much too valuable as an essential source of hard cash. A few poor specimens of sheep were kept for their wool, which was worked at home to clothe the family. Very rarely, a dish of mutton might be eaten but this was an unusual occurrence. 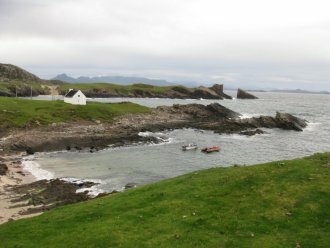 Tenant farmers near the coast supplemented their diet and income with fishing. The late 1700s and early 1800s was a time of much change and emigration from the Highlands. The French Revolutionary and Napoleonic wars were being waged in Europe and the demand for wool increased the price. Many of the English landlords engaged lowland or sometimes English property managers with expertise in more profitable sheep farming, to replace the traditional highland cattle. They ‘encouraged’, often forcibly, the population to move off suitable land. Under Scots law, there were only year-by-year tenancies, so it was easy to raise rents to unsustainable levels or to evict. In one case, the rent had increased from £5 to £20 over a 25-year period while income had remained almost stable. The dispossessed Highlanders were 'resettled' in poor crofts or small farms in coastal areas where farming could not sustain the communities. They were a source of very cheap labour in enterprises that were also controlled by the English -- large scale herring fisheries for the London markets and the very profitable collection and processing of kelp. Both enterprises involved back-breaking work in freezing waters. Not surprisingly, mass emigration ensued. Even those who had been able to continue as tenant farmers were attracted by the opportunity to become land owners in Nova Scotia, the American colonies and later in Australia and New Zealand. Much has been written about the Reverend Norman McLeod who was the spiritual, moral and community leader for the community of Western Scottish Highlanders and Islanders that my ancestors became a part of. There is no doubt he was charismatic, despite being rigid, fervent and at times vitriolic. Norman McLeod was born in c1780 at Stoer in Assynt, Sutherlandshire. He graduated from the University of Aberdeen with an Master of Arts degree and then went to Edinburgh to do further studies in theology. He became a teacher in Ullapool, but was dismissed because in his fiery lay preaching he criticised the established church and its ministers - he believed they were not strict or puritanical enough in their religious adherence. He emigrated to Pictou, Nova Scotia where he continued to draw large crowds with his preaching and to make enemies by criticising the ungodly ways of the townspeople and the local clergy. McLeod and a some of his followers then moved to St Ann's in Cape Breton, where he could establish his own remote community, away from the sinful influences of Pictou. He served as preacher, teacher and magistrate and encouraged more of the Scots who had been dispossessed by the Clearances to emigrate and settle on Cape Breton. His preaching attracted hundreds, but he became increasingly rigid and vitriolic. Anyone who crossed him was declared 'persona non grata' and they and their business had to be shunned by the community - a practice which ultimately contributed to the demise of its trading capacity and viability. After 30 years in Nova Scotia, McLeod led his people in search of a new utopia, this time sailing to the other side of the world. Eventually, nearly 900 'Normanites' from Nova Scotia settled in and around Waipu in Northland, New Zealand. Once again, McLeod, now in his 70s, had established a community for his followers, where they could live together in material comfort and his version of religious freedom. The Rev. Norman McLeod died at Waipu in 1886. He continues to be seen as a controversial figure. His public denunciations of wayward parishioners and anyone who disagreed with him earned him a reputation as an autocratic demagogue. His parishioners, however, saw him as a caring pastor and defender of the weak. Today, McLeod's primary legacy is the Scottish community which still thrives in Waipu and the surrounding districts. Clachtoll coast, Western Scottish Highlands. on a headland at Clachtoll. 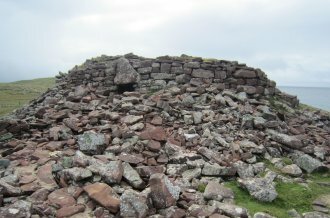 left Clachtoll nearly 200 years ago. the remote easten boundary of Clachtoll. near Loch Crocach, which the McLeods would have used when the Highland cattle were in summer pasture. 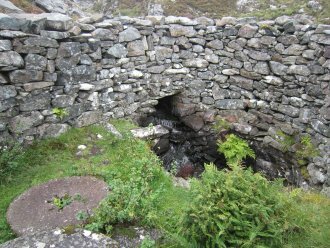 C17th mill at Altan na Bradhan, near Clachtoll, which our McLeods would have used to gind corn. It had a water flume from the creek which drove wooden paddles underneath the horizontal grinding stones.